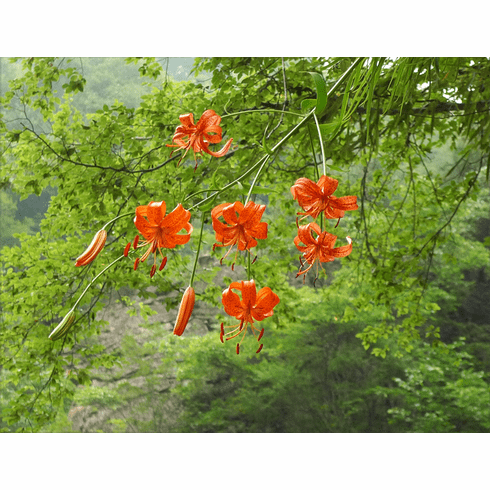 Title photo and insert photo #1 is of Lilium davidii found by Mr. Yijia Wang near Foping City in Shanxi Provence of China at about 5000 feet (1500 meters). Title photo is close up of stem in first insert showing how this lily was growing out of the side of a rock cliff, hanging out into open space. Copyright Yijia Wang, all rights reserved. Used with permission. Yijia does offer seed of several Chinese Alpines at his nursery as www.canursery.com as well as seed of other native plants from the alpine regions of China. Photo inset #2 is Lilium davidii being "visited" by one of our native Swallowtail butterflies (Papilio rutulus). As with most of the orange and red Lilium species, butterflies love them, and seem to be more attracted to the wild flowers than the hybrids, possibly because of the reflexed flower form. A lepidopterist (butterfly specialist) recounted to me that butterflies prefer to hang from flowers rather than sit on top of them as when they are atop a flower, they have no protections from airborne predators (swallows in particular). Hanging from a flower offers some camouflage and protection from attack. Photo insert #3 is of L. davidii growing in a cool greenhouse where it is being used for seed production. Photo inset #4 of of L. davidii var. 'Oriole' from the collection of photos provided by the daughter of Bill and Mary Hoffman. L. davidii var. Oriole was registered by Isabelle Preston in 1935 as being an open pollinated seedling of L. davidii. This "studio" photo, typical of how Edgar photographed his lilies is circa. 1947 - 48.